MANASSAS, VA – January 19, 2011 – The Traveling Guitar Program is excited to announce that Ian Thornley has joined the program as a Performing Sponsor. Ian is a Canadian rock guitarist, vocalist, and songwriter, born and raised in Toronto. He launched his career with the band, Big Wreck in the 1990s and is currently recording under his own name Thornley with a number of accomplished musicians in his touring band. Ian Thornley is a guitarist, vocalist and songwriter who studied jazz music at Boston's Berklee College of Music as well as forming the bank Big Wreck in 1993. Big Wreck signed with Atlantic Records releasing their debut album 97, In Loving Memory Of..., which did well in both Canada and the United States. Big Wreck went on to release one more CD before disbanding in 2002. Ian played in Toronto as well as doing session work with Nickelback, Sarah Harmer and Stephen Fearing before starting his band Thornley which released his first CD Come Again, in 2004 and second CD Tiny Pictures February 10, 2009. Ian recently re-united with Big Wreck guitarist Brian Doherty from Big Wreck and toured across Canada last month. He is currently recording a new album. Annually, the Traveling Guitar Project (www.travelingguitar.org) sends custom built guitars on a journey from artist to artist, state to state. The guitars are played and signed by guitarists from all music genres. After a year on the road, the guitars are auctioned on eBay with 100 percent of the proceeds being donated to fund music education and programs for those unable to pursue these activities due to limited resources. For more information on the journey and auction of the Traveling Guitars, visit http://www.travelingguitar.org. Manassas, Virginia – November 23, 2010 – The Traveling Guitar Program, a charitable endeavor that raises funds for innovative music education, announces that 100 percent of the proceeds of its 2010 “Traveler” guitar auction will be donated to GUITARS IN THE CLASSROOM (GITC) a non-profit providing free music programs from coast to coast. Each year, the TRAVELING GUITAR PROGRAM sends a one-of-a-kind custom-built guitar on a journey from artist to artist, state to state, collecting stage time and autographs. At the end of its journey, the "Traveler" is auctioned off to support one special organization. 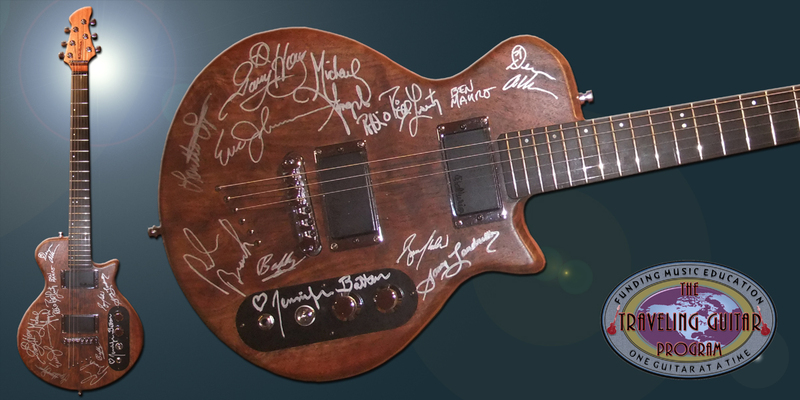 This year's Traveler features signatures from Eric Johnson, Devon Allman and Loretta Lynn, among other musical luminaries. Check out the Gallery on the Traveling Guitar website for a list of all the artists. This year’s auction of the “Traveler 1” will be just in time for the holiday season. The Ballurio Lingo Custom has been visiting guitarists throughout the year and is now being prepared for auction on eBay starting FRIDAY, DECEMBER 10, 2010. All proceeds will be donated directly to GITC for assistance with their music programs around the nation. Keith Ballurio, founder of the Traveling Guitar, explains, "We are excited to be working with GITC. This is the absolutely the perfect fit for our vision. The GITC mission is to inspire, train and equip teachers to integrate music in the academic curriculum. I cannot think of a better way to make sure that children get musical opportunities every day. We are thrilled to help GITC provide teachers and kids with firsthand guitar experience." GITC’s programs take place in communities as diverse as urban neighborhoods, remote tribal reservations, and small rural settings. The work takes shape when individuals contact the organization and ask to get involved. Says Jessica Baron, GITC’s founder and executive director, “This work happens because motivated people who understand how music opens children’s hearts and engages their minds decide to take action. Keith Ballurio is one of those special people. GITC can be especially helpful in overcoming the multitude of challenges teachers and kids face together everyday- learning English, focusing and succeeding in class, rising above the daily setbacks of poverty, making friends, and building self confidence. Every teacher GITC trains possesses the potential to reach thousands of children over the course of a career in the classroom. We are so grateful to The Traveling Guitar program for supporting the efforts of GITC. GITC is a non-profit organization that provides innovative musical training for classroom teachers so all students can experience the joy and essential benefits of making music. Its programs deliver ongoing instruction, access to instruments, and educational materials that weave music across the academic curriculum in sustainable, grassroots programs, nationwide. For further information or to get involved, please contact GITC at 760-452-6123 or go online at www.guitarsintheclassroom.org. MANASSAS, VA – October 2, 2010 – The Traveling Guitar Program is thrilled to announce Dave Martone has joined the Traveling Guitar as a Performing Sponsor. Dave is an exceptional guitarist and performing artist and has worked with a growing number of musicians in the industry. He is a prolific composer and performer and has as a number of studio releases and compilation and collaboration works to his name. He also has a number of DVD releases and we are excited that this talented artist has joined the Traveling Guitar. Dave has played hosted clinics or performed with 3 Doors Down, Steve Morse, Jennifer Batten, Paul Gilbert, Yngwie Malmsteen, Marty Friedman, Seymour Duncan, Greg Howe, Joe Satriani and drum greats Chester Thompson, Mike Portnoy, Greg Bissionet and Gene Hoglan. The press has been good to Dave lately with a feature in both Guitar Player and Guitar One magazines as well as being named by Guitar One as one of the top four underground shredders in North America. Dave was also credited on the Joe Satriani’s album Super Colossal. MANASSAS, VA – September 27, 2010 – The Traveling Guitar Program is thrilled to announce that Ethan Brosh has become a Performing Sponsor. Ethan is an exceptional guitarist and performing artist with a growing number of accolades to his name. He has performed with many of today’s rock greats and has started cutting a path through the music scene. Ethan Brosh was born in Suffern, New York. Growing up in Israel, Ethan learned to play both electric and classical guitars. In 2001, soon after receiving a scholarship to the famous Berklee College of Music in Boston, Ethan moved to the states and started receiving a lot of attention from his peers and teachers at the college. In 2004, he graduated with honors and earned a degree in songwriting. In the summer of 2008, Ethan came back to Berklee - this time as a teacher for the guitar sessions program, teaching a few groups of guitar players. In the summer of 2009, Ethan was again a faculty member during the guitar sessions program - this time also playing an all original show at the Berklee Performance Center in front of over 400 guitar players. Ethan is now signed to Magna Carta Records which released his debut instrumental album Out of Oblivion and distributed it to stores internationally on March 24th 2009. The album also features Mike Mangini (Extreme, Steve Vai) on drums and guest appearances by George Lynch (Dokken, Lynch Mob), Greg Howe (Michael Jackson), Joe Stump (Holy Hell) and the art work of Derek "The Best of the Best" Riggs (Iron Maiden). The album was mixed and mastered by the one and only Chris Tsangarites (Ozzy, Judas Priest, Yngwie Malmsteen). Ethan is now the guitar player of the new band ANGELS OF BABYLON along with Rhino (Man O' War, Holy Hell), David Fefolt (Forgotten Realm, Valhalla) and David Ellefson (Megadeth). The debut album, Kingdom of Evil was released on January 29th 2010 on Metal Heaven Records in Europe, in May 2010 on Hydrant Records in Japan, and on July 29th on BurnHill Union Records in America and the rest of the world. Angels of Babylon was featured in several magazines including Burrn! magazine in Japan and as a result Ethan was interviewed/featured in the June issue of YOUNG GUITAR magazine in Japan. At the moment ANGELS OF BABYLON is receiving a great deal of radio support and is doing very well on rock charts. Besides Ethan's significant experience in playing on numerous TV shows and doing lots of session recordings, Ethan is also currently playing regularly in two bands in the New England area - a vocal band called Burning Heat (at the moment in its preproduction stage for its first record) and an instrumental group known as the Ethan Brosh band. Ethan was also the winner of the first ever "Guitar Hook" competition in George Lynch's Guitar Dojo. During the month of December 2009, Ethan was the guitar player for the Rock 4-Xmas tour opening for Eddie Money and playing with Joey Molland (BadFinger), Kelly Keeling (Alice Cooper, Malmsteen, Trans Siberian Orchestra), Terry Illous (XYZ) and the legendary Pat Travers. Ben Mauro grew up in Syracuse, New York. He first began playing guitar at age 16 blasting Led Zeppelin songs in his parents' basement and he says that by age 17 he was totally obsessed with making music. Ben would live for concerts in those days. "I would wait in line for hours for tickets and be wide-eyed watching all my favorite bands up close." He says that's why he still feels like a fan today and usually goes out of his way to meet people that come out to his shows. In those early days Ben would sit in his bedroom, which was lined with Led Zeppelin and Jimi Hendrix posters that he got from an older cousin, and practice for eight hours at a time, dreaming of the day he would be playing concerts in huge stadiums all around the world. His first gig was playing at one of his father's rugby parties. "I grew up around my father's rugby team. I would travel with my dad to his away games and the team would play really hard then after the game they would have a big party with the other team, drink beer and sing songs. It was perfect training." Ben went to school for classical guitar around this time and then headed to New York City where he says his real musical education began. Upon hitting New York he quickly got hired to perform in the house band at The Cafe Wha? in Greenwich Village five nights week, performing from 10pm until 4am. Cafe Wha? is the legendary nightclub where Jimi Hendrix was discovered. At Cafe Wha? Ben would perfect his chops playing and singing many styles of music. After leaving Cafe Wha? Ben worked with various groups that played anywhere from the hard rock clubs of New Jersey to the funk and R&B clubs of Manhattan. Soon the word spread and he was offered the job playing and singing for funk and pop icon Lionel Richie and moved to Los Angeles. Ben's reputation as a dynamic performer also led to jobs playing and singing with many of the top pop stars both on tour and in the studio, including Kelly Clarkson, Christina Aguilera and Britney Spears. Ben's new rock band 13CURVES, for which he is the lead singer and guitar playe, is just releasing their debut CD entitled "Underground." Check out http://www.13curves.com and www.myspace.com/13curves. Steve Fister has toured as a member of the Pat Travers Band, Steppenwolf and the Lita Ford Band- the latter two acts recently made it into VH1’s Top 100 Hard Rock Bands of all time. Steve has shared the stage with Bon Jovi, Yngwie Malmsteen, and Steve Morse, scored television shows and movies, and has released eight solo albums. On his latest album, “Deeper Than The Blues”, Steve fuses a blues foundation to all genres of rock, using aggressive licks with direct and honest vocals. He has toured Europe in support of the CD, including support shows with Joe Satriani. “Deeper Than The Blues” is truly an international effort - recorded in Los Angeles, The Netherlands, and Sao Paulo, Brazil. Steve Fister blends the guitar wizardry of Jeff Beck with a bluesy 70's hard rock vibe, punctuated with the melodic sense of The Beatles. (Nightwatcher’s House of Rock”)… “Guitar ace Steve Fister joins the ranks of today’s rising guitar superstars, and offers undeniable proof of his stature as a masterful solo artist”. (Robert Silverstein in 21st Century Guitar). MANASSAS, VA – September 13, 2010 – The Traveling Guitar Program is excited to announce that David Becker has joined the Program as a Performing Sponsor to help raise support and awareness for the need of youth music education. David Becker, a guitarist, composer and producer, has continued to define himself as one of the best and most unique voices in contemporary jazz guitar by combining diverse influences and a passion for the new and different for more than two decades. Beginning his solo career at the age of 22, David Becker had already toured Europe and the USA extensively before releasing his critically acclaimed debut album LONG PETER MADSEN (MCA) in 1986. He has led the DAVID BECKER TRIBUNE to a worldwide audience by performing in more than 18 countries. Over the years, the DBT has shared the stage with such celebrated jazz acts as Miles Davis, Chick Corea, Michael Brecker and many more. German television journalist Roger Willemsen (ZDF) called him "One of the best Jazz guitarists ever." Jazz Podium and Downbeat called him "A poet on the Jazz Guitar." Jazz Thing and Gitarre & Bass called him” a virtuoso”. David has released 10 recordings, many topping the jazz and contemporary music charts, two of which made it to the Grammy nominations. The DBT has performed at some of the most prestigious venues throughout the world, including London's Barbicon Centre, Rotterdam's De Doelen, Munich's Olympia Halle, Buenos Aires’ Ateneo and New York’s Birdland. The DBT has also appeared at several international jazz festivals, including Saulkrasti Jazz Festival, Latvia, La Plata Jazz Festival, Argentina, Jazz op den Berg, Belgium, Robert Norman Festival, Norway, and Hildener Jazz Tage, Germany. In 2005, Becker released a duo effort with guitar master Joe Diorio, THE COLOR OF SOUND. The CD was called "One of the best Guitar duo recordings of all time." The latest DBT release LEAVING ARGENTINA is continuing to receive high praise by the international press. Down Beat gave it “4 Stars” and the BBC said,” Brilliant musicianship. A really lovely album, in fact”. David Becker has also performed with guitar greats such as Atilla Zoller, Larry Coryell, John Abercrombie and Kenny Burrell. And his music can be heard on radio and television around the globe including ARD, The Weather Channel, Voice of America, XM and Sirius Radio, NPR, Europa Plus, and AEI In-Flight Entertainment. He recently released an instructional book called GETTING YOUR IMPROVISING INTO SHAPE (Mel Bay/Acoustic Music). The book is a top seller and has received great reviews all over the globe. The book is available in English and German. He has performed master classes and workshops around the world including UNT in Denton, U of Arts in Philadelphia, Strathclyde University, Glasgow, Conservatorium, Maastricht, Hochschule, Köln, Music Tech College, St.Paul, Guitar Summer Workshop, Freiburg, Academy of Contemporary Music, Zurich, Musicians Institute, Hollywood and USC Thornton School of Music. MANASSAS, VA – September 10, 2010 – The Traveling Guitar Program is thrilled to announce that Jon Poussette-Dart has joined the Program as a Performing Sponsor to help raise support and awareness for the need of youth music education. Jon Pousette-Dart captained the Pousette-Dart Band through four albums for Capitol Records between 1976 and 1980, a run that acquainted a generation with his formidable gifts as a singer, songwriter, arranger, guitarist and all-around musical adventurer. During this time, the Pousette-Dart Band became one of the busiest touring groups in the U. S., working with such acts as the Byrds, Bonnie Raitt, Little Feat, James Taylor, Yes, the J. Geils Band, Eddie Money, Peter Frampton, Journey and Billy Joel. Born in New York City, New York, Pousette-Dart began playing the guitar when he was seven. At 13, he joined a band called "Tony & The Tigers" that included two of comedian Soupy Sales' sons. During the breaking-in period, he performed with the group on such high-profile network shows as Hullabaloo and To Tell The Truth. They also played in concerts with the elder Sales. In 1973, he formed the Pousette-Dart Band with John Troy, his college mate from the University of Pacific, and a new recruit, John Curtis. Initially, the band played college gigs. But in 1975, legendary promotion man Al Coury signed the group to Capitol. By this time, Pousette-Dart was being managed by music mogul Don Law. The first album, Pousette-Dart Band, was released in 1976, followed by Amnesia (1977), Pousette-Dart Band 3 (1979) and Never Enough (1980). Although the band worked the pop music arena, three of its Capitol albums were cut in Nashville under award-winning producer Norbert Putnam. After the band closed up shop in 1981, Pousette-Dart moved back to New York, where he established himself during the following decade as a top writer, slide guitarist and singer for recording sessions and advertising jingles. The Pousette-Dart Band reunited in 1991 for a series of dates. Jon was invited to Nashville at this time, by A&R man John Condon of Asylum Records. Pousette-Dart teamed with some of Nashville's top songwriters, among them Gary Burr, Darrell Scott, Al Anderson, Kostas, Fred Knobloch, Jaime Kyle, Tom Kimmel and Jennifer Kimball. In 1997, he recorded the solo album Ready To Fly. He subsequently re-titled the collection Put Down Your Gun to support the Anti-Handgun Coalition. Pousette-Dart extended his musical reach through 1998 to 1999 by producing 5 episodes for the History Channel, titled "Gunfighters of the West", and garnered forces with blues diva Toni Lynn Washington, who went on to record his songs on her latest release produced by Duke Robillard. His own album, Sample This, released in 2000, contained solo tracks, as well as ones he had recorded with Kostas, Lowell George (with whom he toured in the 70s) and John Bohlinger. He also appears on Jesse Winchester's upcoming DVD, singing with Valerie Carter and an all-star band featurin John Sebastion, Jim Horn, Victor Krauss, and many others. He recently finished shooting a new video and his next new release. A new issue of the Capitol years is also scheduled for release in the upcoming season. MANASSAS, VA – September 6, 2010 – Sonny Landreth, an American blues musician, guitarist/slide guitarist, recording artist and performer, has joined the Traveling Guitar Program as a Performing Sponsor, to help raise support and awareness for the need of youth music education. Sonny Landreth (born February 1, 1951) is an American blues musician from southwest Louisiana who is especially known as a slide guitar player. He was born in Canton, Mississippi, but soon after his family moved to Jackson, Mississippi, before settling in Lafayette, Louisiana. When he is not touring and performing, he resides in Breaux Bridge, Louisiana. Landreth has also recorded with Jimmy Buffett, and accompanied him on his 2006 and 2007 summer tours, and is presently accompanying him on his 2010 tour. Sonny Landreth has performed on many other artists' albums, including albums from Little Feat, Jimmy Buffett, John Hiatt, Waterline, John Mayall, Bobby Charles and The Goners. He has performed with Bonnie Raitt, Mark Knopfler, Steve Conn, Michael Organ (drummer), Eric Clapton, Gov't Mule, Mike Gordon, Bernie Worrell, and Buddy Guy, among others. Landreth performed at Clapton's Crossroads Guitar Festival in 2004 and 2007, and he performed at the 2010 Festival in Chicago, IL, on June 26, alongside BB King, Jeff Beck, Buddy Guy, Doyle Bramhall II, Hubert Sumlin, Jimmie Vaughan, Joe Bonamassa, Jonny Lang, Keb' Mo', Robert Cray, ZZ Top, Vince Gill, and Steve Winwood... to name a few. MANASSAS, VA – September 3, 2010 – Jennifer Batten, Guitarist, Performer and Author has joined the Traveling Guitar Program as a Performing Sponsor, to help raise awareness of the need of music education. Jennifer Batten rose from the guitar underground, and the guitar magazines promptly began chronicling her savvy musicianship and highly original approach to the electric guitar. A major turning point came when she was selected from over one hundred guitarists to play in Michael Jackson's highly skilled band which toured the world for one and a half years playing for over four and a half million people. Jennifer wasted no time after the” Bad” Tour's grand finale, diving into work on her debut album with renowned producer (and Stevie Wonder guitarist) Michael Sembello. Upon “Above, Below, and Beyond's”, release in the spring of '92, she was asked again to join Michael Jackson for his upcoming "Dangerous Tour". In January '93, she joined Jackson to participate in Superbowl XXVII's half time entertainment which aired to one and half billion people in 80 nations. It was the largest audience in television history. Her follow up CD "Momentum" which was heavily influenced by world music, was released just before she left for Michael Jackson's HIStory world tour in 1997. In the spring of '98 Jeff Beck asked Jennifer to join his band. They joined forces for 3 years on the CDs "Who Else" and “You Had It Coming” which were both supported by world tours. Jennifer has authored two music books and has just released her third solo CD/DVD entitled “Whatever”. With this 3rd effort, she’s ventured into electronica, vocal samples, and film. She’s supporting this release with a multimedia one woman show, playing guitar in synch with projected films. The companion DVD includes over 90 min of art films, previously unreleased music videos, interviews, commentary, and an innovative guitar lesson. Jennifer is currently touring the world with her new multimedia film/music show. Several years ago, the General Music classroom at Valley View Middle School had become outdated and limited in its resources and student interest. With the gracious help from the Traveling Guitar, we are able to offer an exciting program inviting students to develop their creativity while fostering important learning in the areas of music history, theory, composition and technique. This wonderful gift will give over 340 students from the 5th grade through the 8th grade an opportunity to experience making music through learning how to play the guitar. From each of these experiences many students will begin taking private guitar and piano lessons. Providing these musical experiences helps to shape good citizenship and promotes continued support of the arts through our children. Supplying these valuable tools invokes musical creativity and keeps our students involved in community events. We recently formed a guitar club that meets weekly after school providing students with an outlet to pursue stronger interests. Through this club, students have the invaluable opportunity to work with other students from various grade levels. A great deal of inspirational learning occurs in this environment. Students choose music together and work towards a concert performance. Many students have expressed strong interest in playing "electric and bass electric guitars." Our current objectives are to expand our program to include electric guitars and stock necessary items such as strings and required accessories like tuners, effects, and storage units to house equipment. By setting up storage and supply cabinets, we can maintain and service our guitars properly, an area where the Traveling Guitar will help greatly. Current trends show that along with a traditional program, we should continue to foster student involvement in the arts by including music and instruments that attract student attention. The guitar whether it be acoustic or electric is the main instrument of choice for middle school aged children. student from the Traveling Guitar Foundation gives inspiration to the children. Given the fact that our current economy limits our desired goals and dictates that we maintain only what is necessary to provide students education in the arts, purchasing this equipment and supplies remains only a strong desire toward our future goals. With the help of donations and supplies from The Traveling Guitar, we will realize these goals. The Watchung School District would like to thank the founders Damon Marks and Keith Ballurio for considering us for their amazing music education donations. We are honored to be granted this opportunity to represent the Traveling Guitar. Manassas, Virginia – December 12, 2009 – The Traveling Guitar Program has just listed its first guitar for auction on eBay (Listing). The auction is for a Lingo G2/4 Prototype donated by Keith Ballurio, owner of Ballurio Guitars. The auction is not only for the guitar, but also for the extensive package of accessories and guitar gear provided by the Program’s sponsors such as D’Addario, Planet Waves,and Premier Guitar (www.premierguitar.com ) and Guitar Edge magazines. The auction is a standard 7-day eBay auction with 100 percent of the proceeds being donated to charity. Keith Ballurio, co-founder of the Traveling Guitar, said, "I am thrilled to have a Ballurio Guitar be the first guitar auctioned to support this program. All the sponsors, D’Addario, Planet Waves, Premier Guitar and Guitar Edge Magazines, Crossroads Guitar Shop (www.crossroadsguitarshop.com), Rock Hard Road Cases (www.rockhardcases.com), and Northland Forest Products (www.northlandforest.com), really stepped up to the plate making this a great kickoff for the Program. Although this guitar is not the “Traveler,” one of the two guitars built to travel around the country from artist to artist, it has done a little road time visiting Damon Marks and Bruce Kulick." About the Traveling Guitar ProgramAnnually, the Traveling Guitar Project (www.travelingguitar.org) sends two custom built guitars on a journey from artist to artist, state to state. The guitars are played and signed by guitarists from all music genres. After a year on the road, the guitars are auctioned on eBay with 100 percent of the proceeds being donated to fund music education and programs for those unable to pursue these activities due to limited resources. In addition to the “Traveler,” the Program also accepts donations of guitars for auction with 100 percent of the proceeds donated to charity. For more information on the journey and auctions of the Traveling Guitars, visit http://www.travelingguitar.org. Auction proceeds from program go to Music Based Programs and Charities. MANASSAS, VA – November 6, 2009 – The Premier Guitar and Guitar Edge multimedia networks have teamed up with the Traveling Guitar Program to raise support and awareness on a global scale for the need of music education where resources are scarce. As sponsors of Traveling Guitar, Premier Guitar and Guitar Edge will be lending their global reach to more than 600,000 guitarists around the world to the program and its mission of improving access to music education. Annually, the Traveling Guitar Program sends two custom-built guitars on a journey from artist to artist, state to state, collecting stage time and autographs. At the end of their journey, the guitars are auctioned with 100 percent of the proceeds going to support charity. Donated guitars will be collected, have the setup checked and if needed, corrected. The guitars will then be auctioned online with 100 percent of the proceeds going to support the Make a Noise Foundation. Both aspects of the Traveling Guitar Program will be substantially promoted by Premier Guitar and Guitar Edge and winners of the Traveling Guitar auction will receive a one-year subscription to each print magazine. Keith Ballurio, founder of the Traveling Guitar, says, "The addition of Premier Guitar and Guitar Edge as sponsors to the program is very exciting. The generous donation of promotion and complimentary subscriptions to the ‘premier’ gear and guitar instruction magazines shows their dedication to spreading the joy of music." For more information, contact Keith Ballurio at 703-791-2020. Annually, the Traveling Guitar Project sends custom built guitars on a journey from artist to artist, state to state. The guitars are played and signed by guitarists from all music genres. After a year on the road, the guitars are auctioned on eBay with 100 percent of the proceeds being donated to fund music education and programs for those unable to pursue these activities due to limited resources. For more information on the journey and auction of the Traveling Guitars, visit http://www.travelingguitar.org. The Guitar Edge multimedia network features four integrated platforms; the Guitar Edge Web site (www.guitaredge.com); the free Guitar Edge digital magazine (http://digital.guitaredge.com); the Guitar Edge print magazine; and Guitar Xtra, a free weekly E-newsletter. Guitar Edge was first published by Hal Leonard in July/August 2006 as a bimonthly print magazine. Through a joint venture, established in July 2009, between Hal Leonard and Premier Guitar, Guitar Edge has adopted the four-platform multimedia model, pioneered by Premier Guitar. Guitar Edge is the world's first and only online resource for free artist-approved, fully-licensed authentic guitar tab. Offering guitarists a multimedia source for news, gear info and education/instruction, Premier Guitar is the media home for players who are serious about their tone. PG's gear‐centric print magazine has a monthly readership of more than 51,000 complemented by its freely accessible digital magazine (http://digital.premierguitar.com) which attracts more than 31,000 monthly visits; a Web site (www.premierguitar.com) that's the fastest-growing portal in the guitar industry with an average of more than 500,000 unique visitors consuming almost 11 million page views per month; and the market's leading interactive gear search service that attracts more than 200,000 monthly visitors. With nearly 50,000 pieces of gear, players can find, buy and sell gear on Gear Search (http://www.premierguitar.com/gear/gear_search.aspx). Published by Gearhead Communications, LLC, Premier Guitar is employee-owned and based in Mount Vernon , Iowa with offices throughout the U.S.
MANASSAS, VA - August 27, 2009 - Being on the road without great strings and accessories is like performing naked, D'Addario, the new sponsor for the Traveling Guitar Project, is ensuring that all Traveling Guitars wear nothing but the best. Annually, the Traveling Guitar Project, sends two custom-built guitars on a journey from artist to artist, state to state, collecting stage time and autographs. At the end of their journey, the guitars are auctioned with 100 percent of the proceeds going to support music programs. These guitars will now go on the road dressed in the finest - D'Addario strings and accessories. Keith Ballurio, founder of the Traveling Guitar, said, "We are thrilled with the addition of D'Addario as a sponsor of the Traveling Guitar. The quality of their products and their company commitment to giving back and supporting charitable projects make them a perfect fit for our organization." Angela Magliocca, D'Addario & Company, Inc. added that, "Making music isn't a hobby. It's a condition. Like eye color, male-pattern baldness, and your penchant for Franklin Mint figurines, music is something you can't help. Making it is part of your genetic code. It's part of ours, too. Over three centuries ago in the Italian village of Salle, a small group of D'Addario's (da-dairy-ohs) sat around trying to figure out how to make musical strings out of sheep guts. Today, their descendants are running the largest musical string company in the world, churning out over 400,000 strings per day, making D'Addario "The First Choice" - and don't even get us started on the other cool music accessories from Planet Waves. All the straps, cables, and other tools you need to be the rock star you always knew you were. D'Addario's donation of strings, straps, tuners, gadgets and gizmos to Ballurio Guitar's Traveling Guitar Project proves D'Addario's appreciation for and commitment to spreading the love of music." D'Addario & Company, Inc. (www.daddario.com) designs, manufactures, and markets complete lines of strings for fretted and bowed musical instruments, drumheads, drum practice pads, and guitar and woodwind accessories under the proprietary brand names D'Addario, Evans Drumheads, Planet Waves, Rico, HQ Percussion and PureSound Percussion. The company also runs the popular Gbase.com online gear source. D'Addario products are marketed in approximately 120 countries.